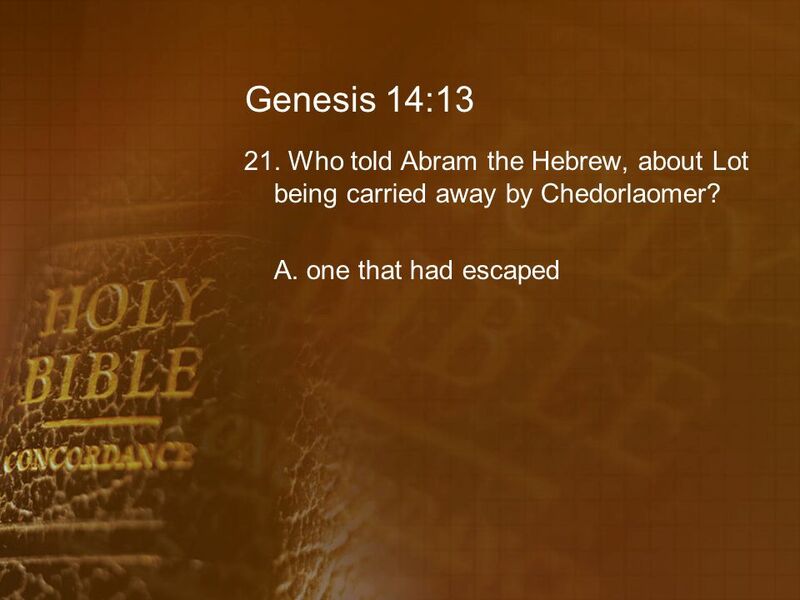 21 Genesis 14:4 10. 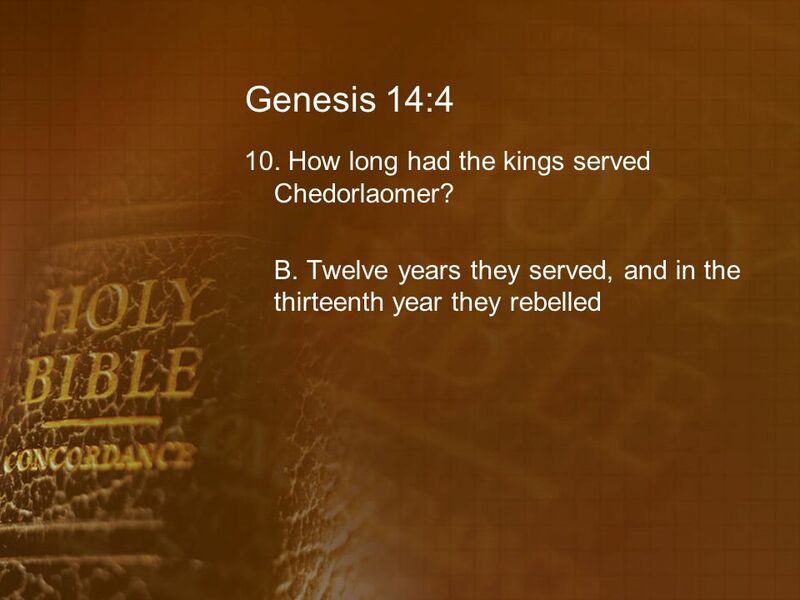 How long had the kings served Chedorlaomer? 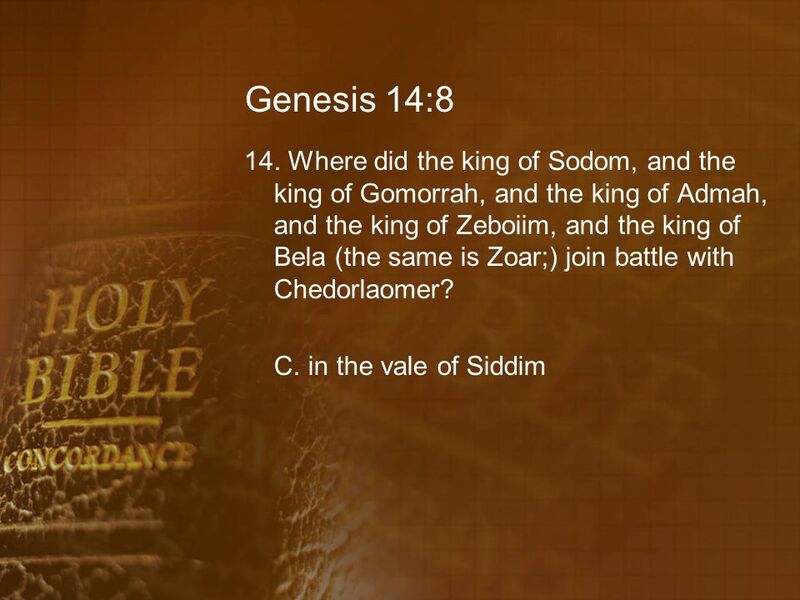 25 Genesis 14:6 12. 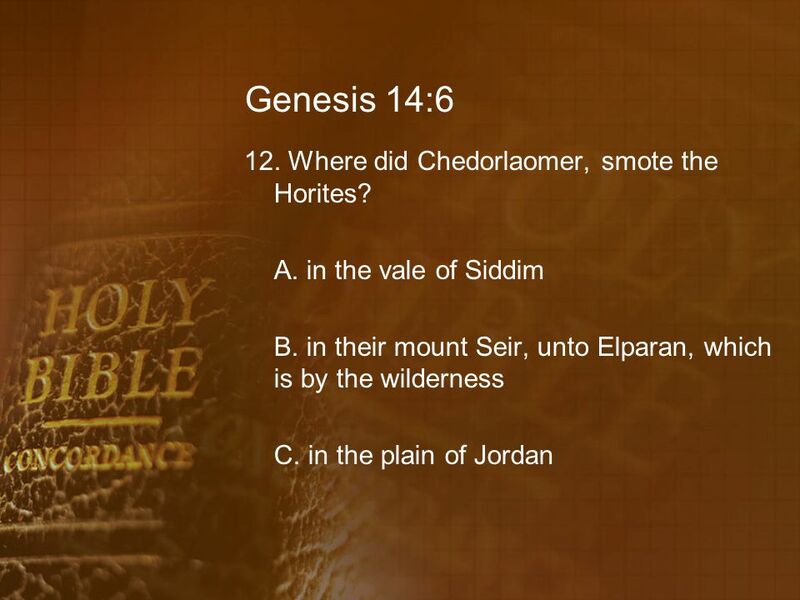 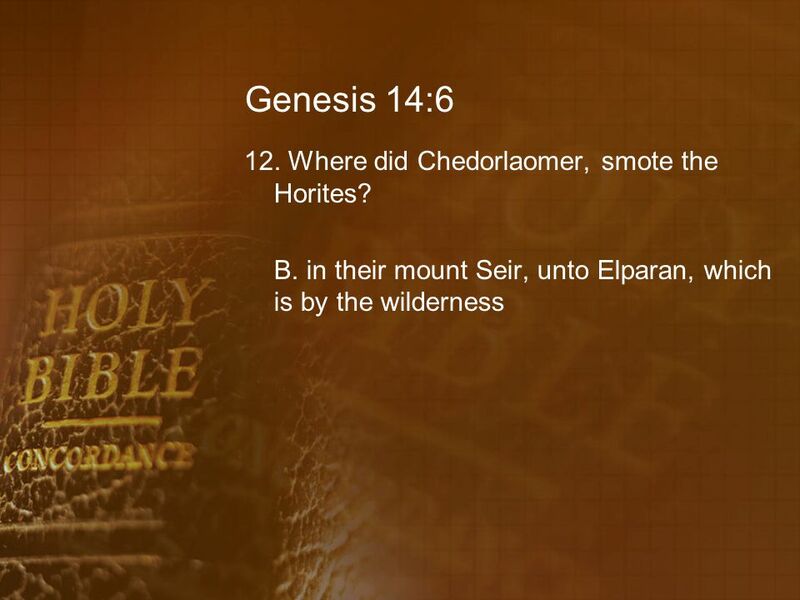 Where did Chedorlaomer, smote the Horites? 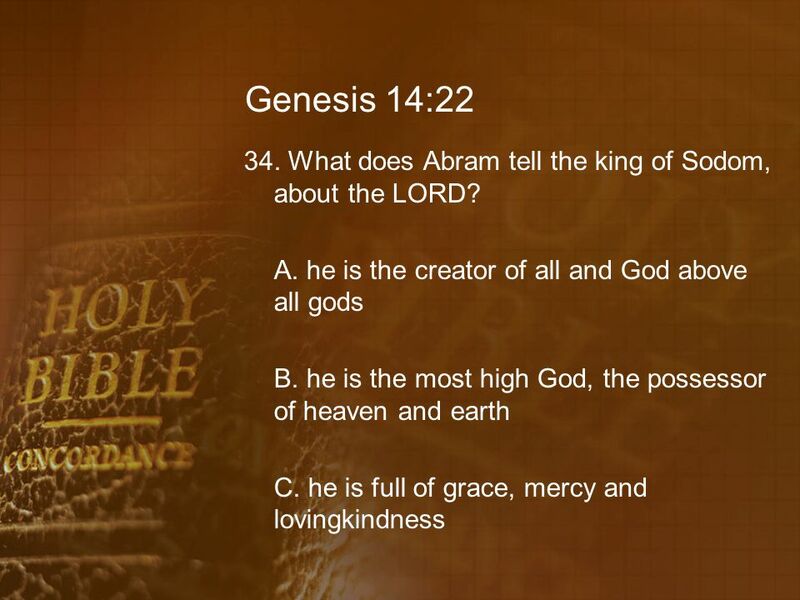 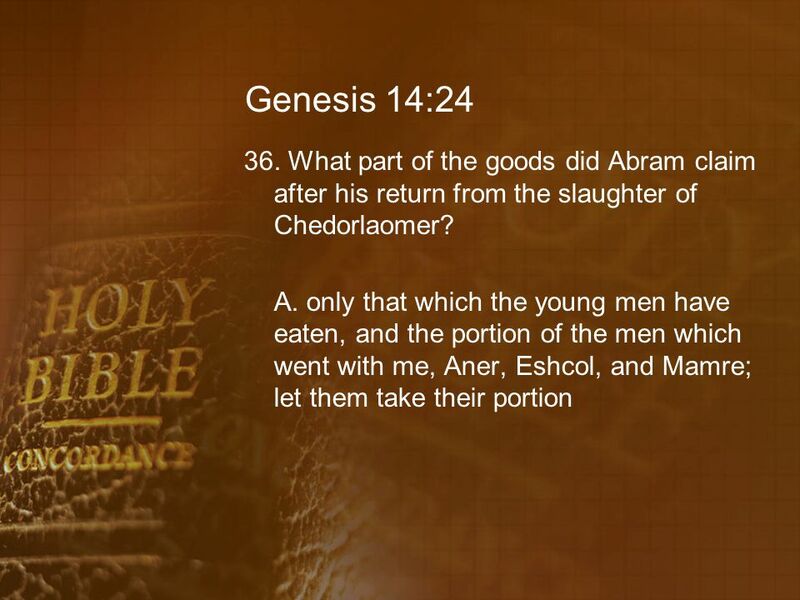 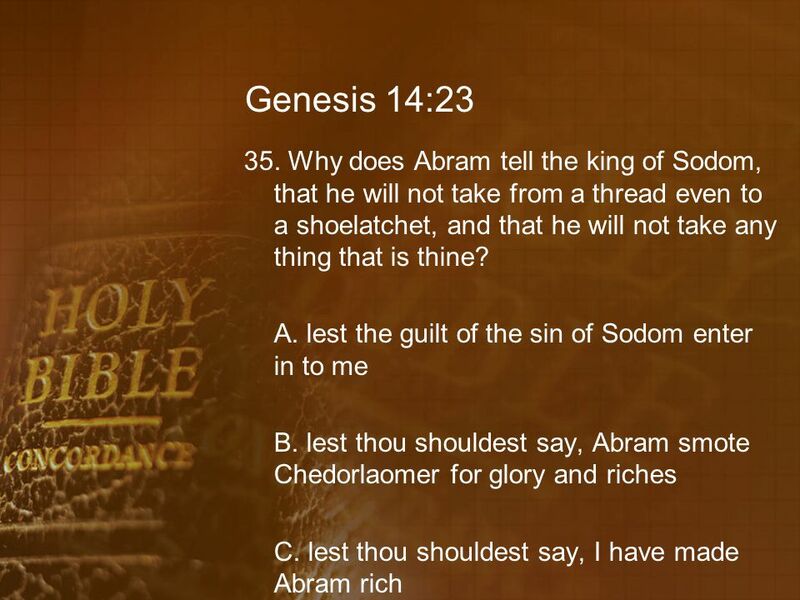 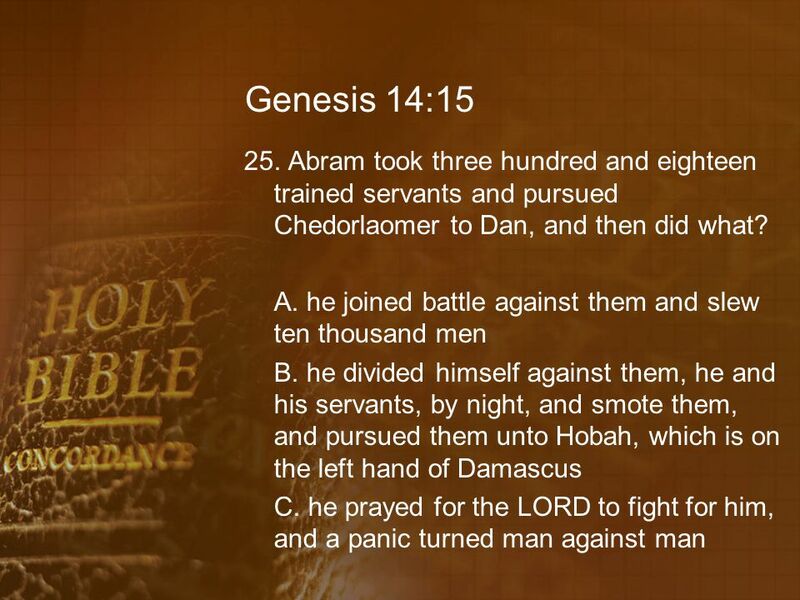 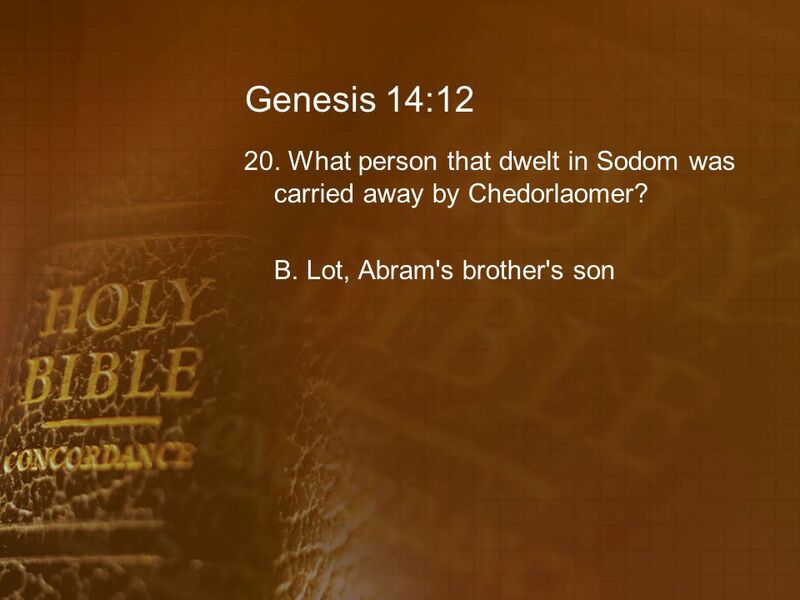 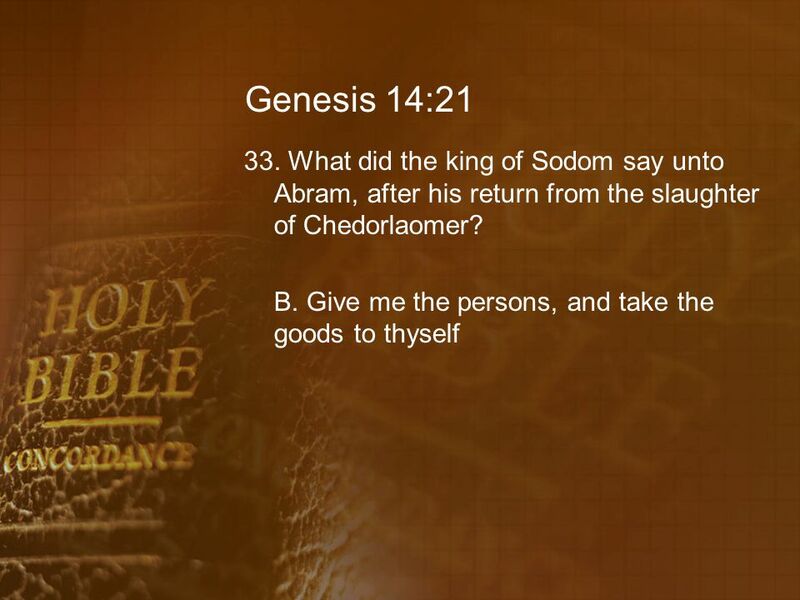 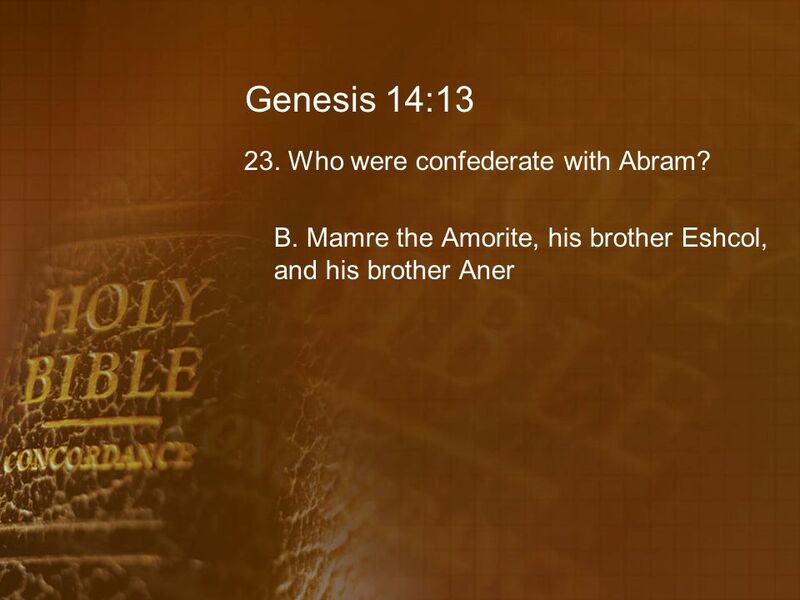 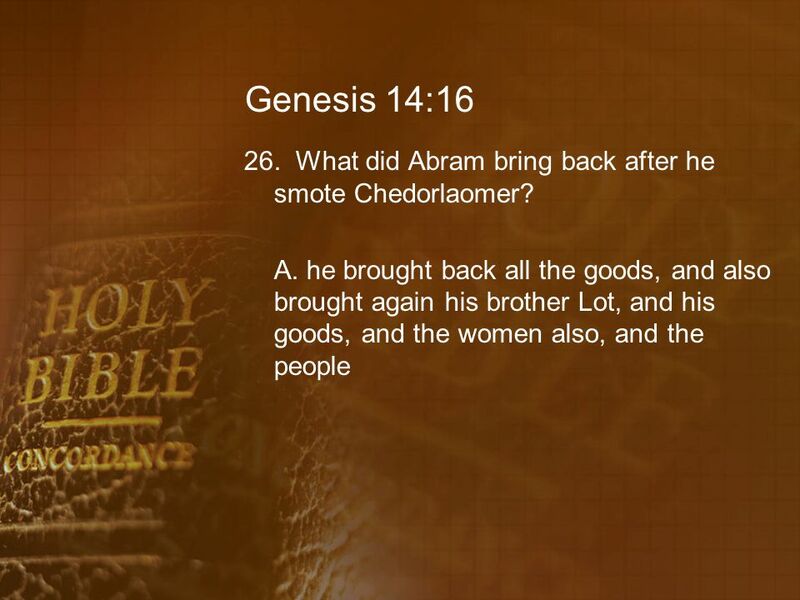 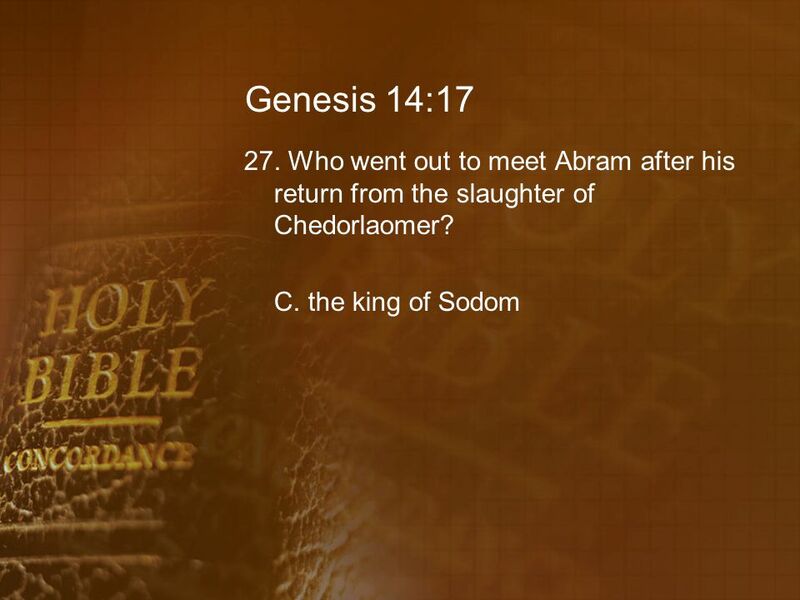 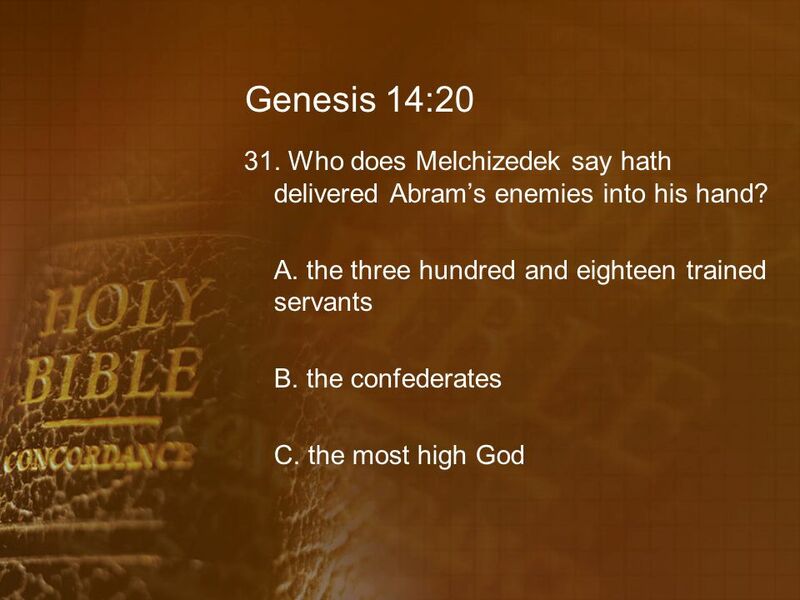 47 Genesis 14:13 23. Who were confederate with Abram? 61 Genesis 14:19 30. 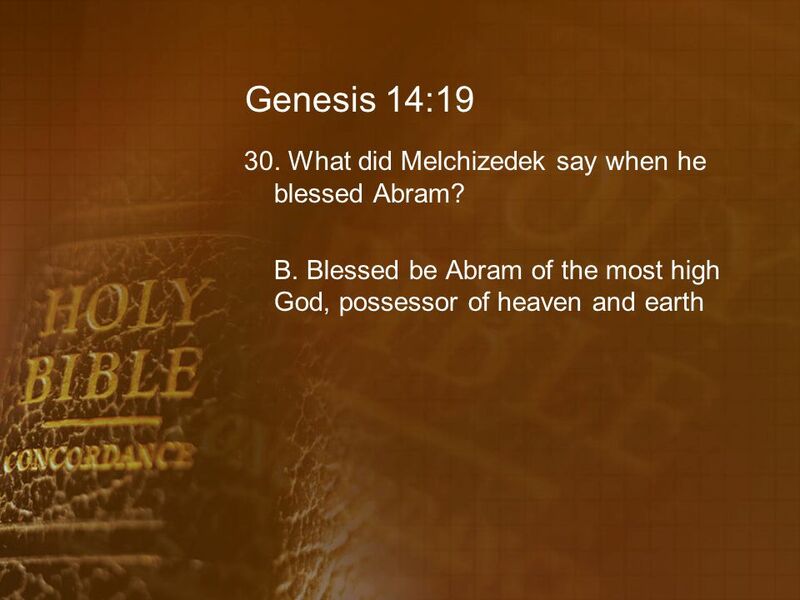 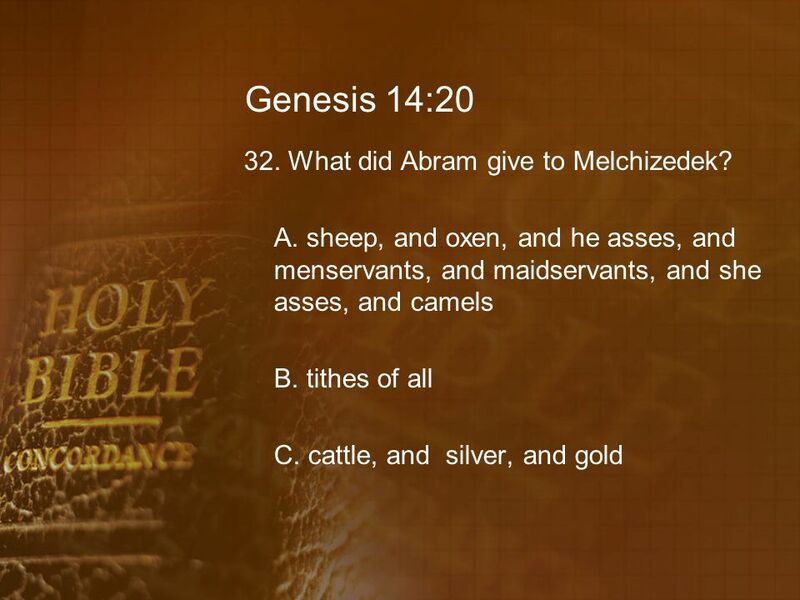 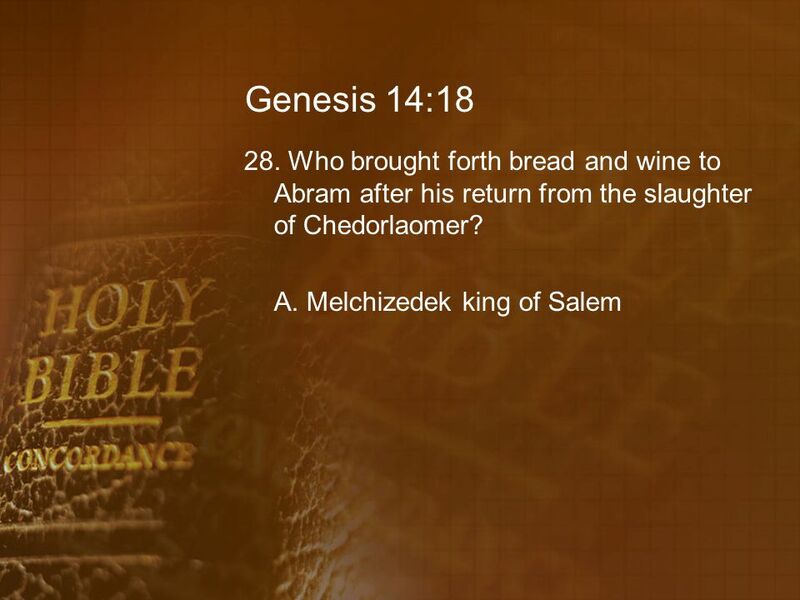 What did Melchizedek say when he blessed Abram? 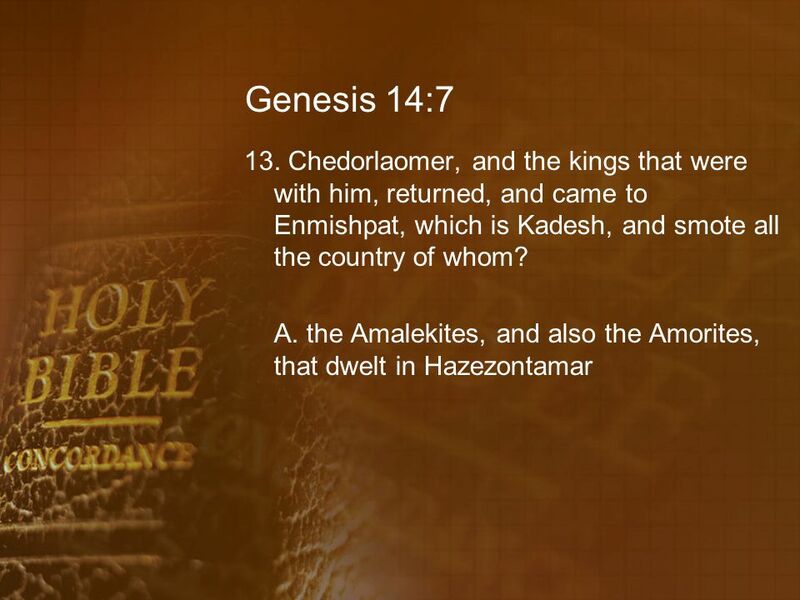 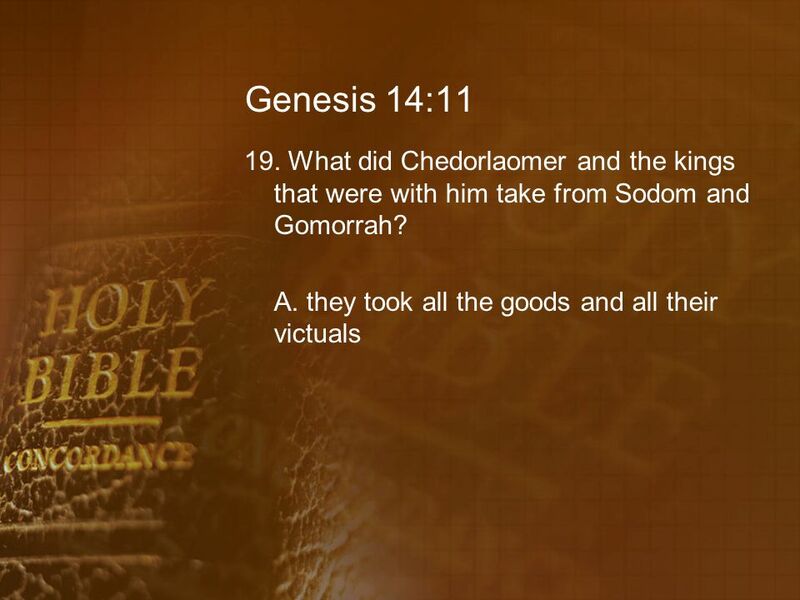 Download ppt "Genesis Chapter Fourteen Questions"
NATION NATION LAND LAND ALL FAMILIES BLESSED ALL FAMILIES BLESSED ISRAEL. 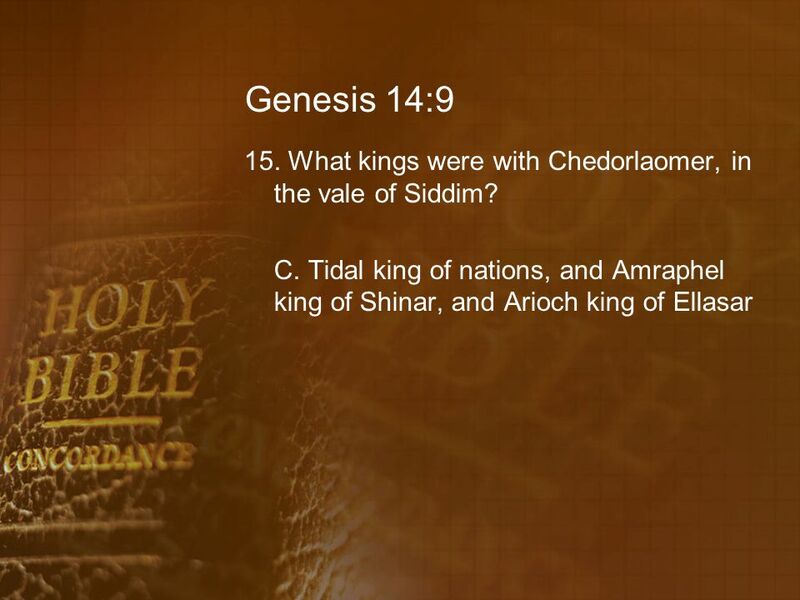 Euphrates River Canaan Haran Egypt Ur of the Chaldeans Shinar Ellasar Elam Kadesh King of Nations Valley of Siddim 4 Kings         Genesis 14:1. Genesis Teaches Faith: Warrior Genesis 14:1-24 BOLD. 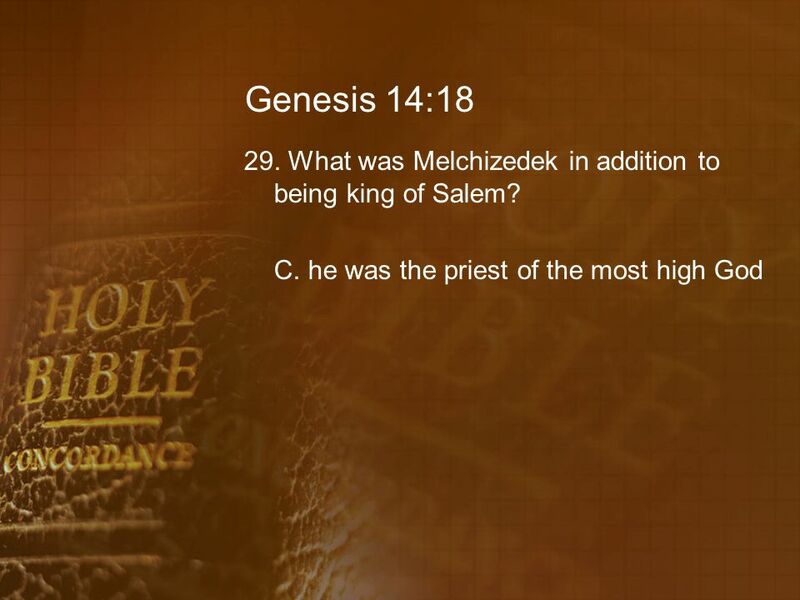 MELCHIZEDEK A TYPE OF CHRIST. 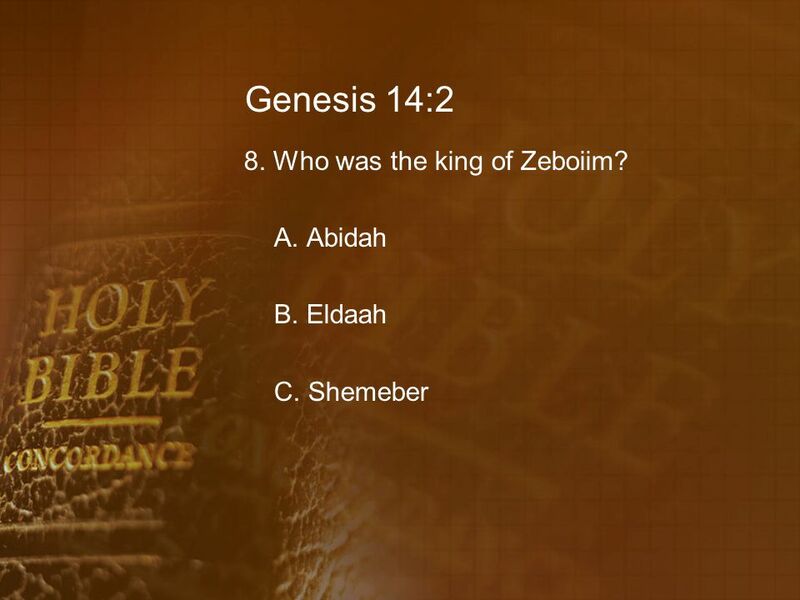 Review Genesis Chapters One - Sixteen Bible Bowl 2013. 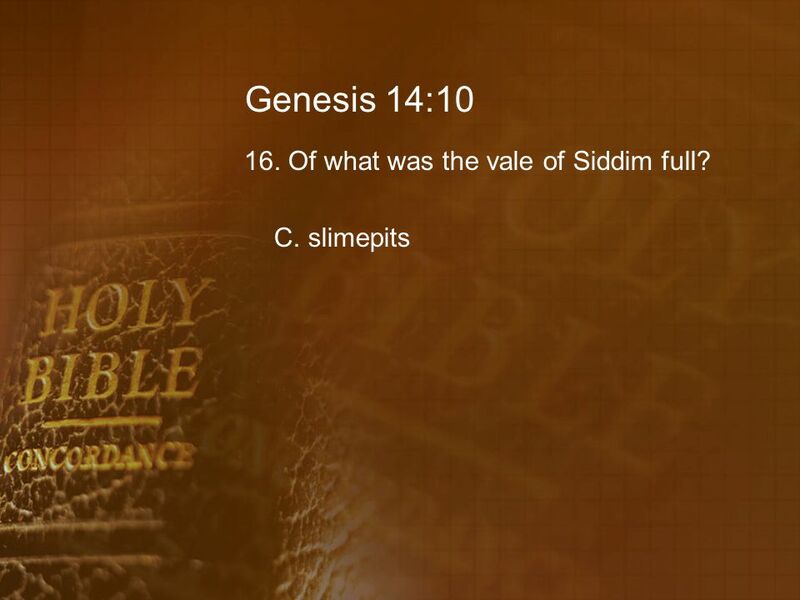 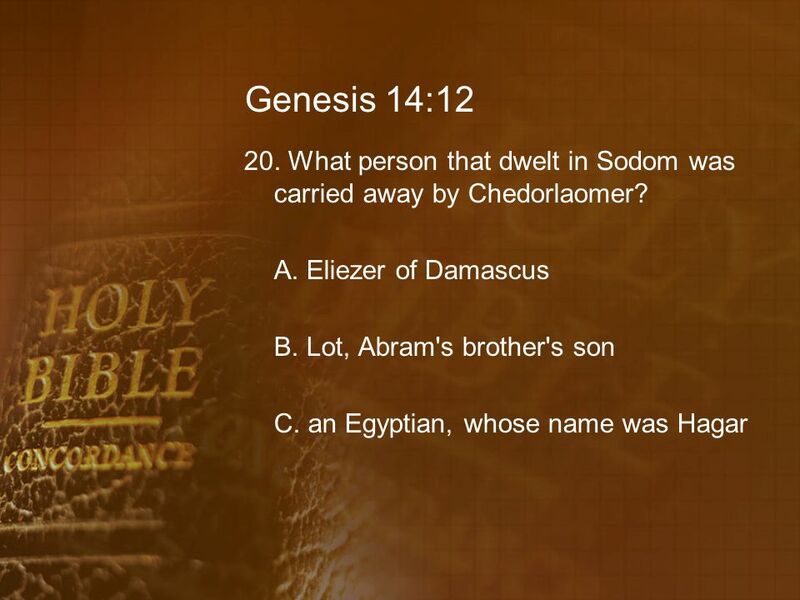 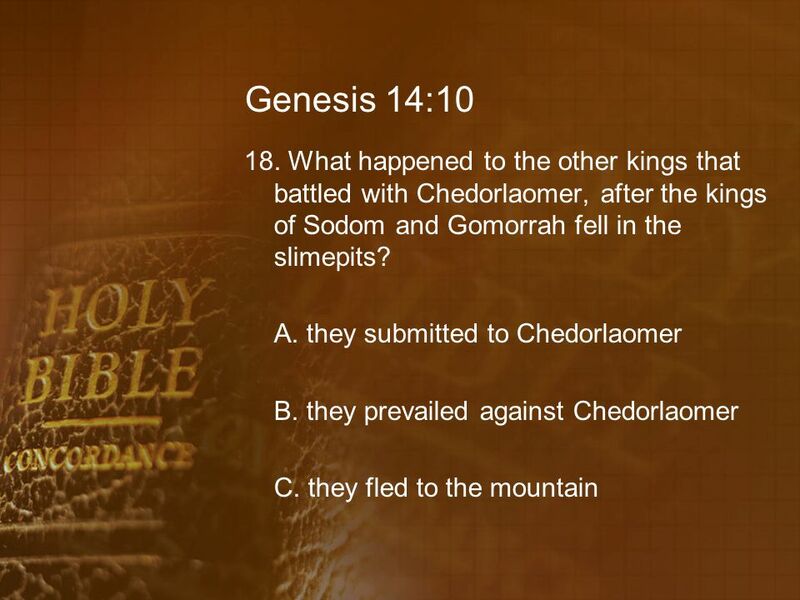 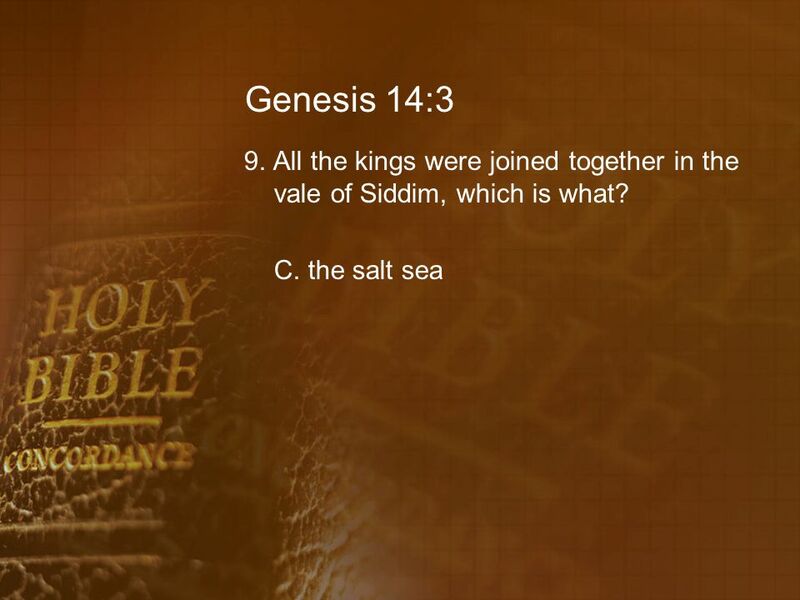 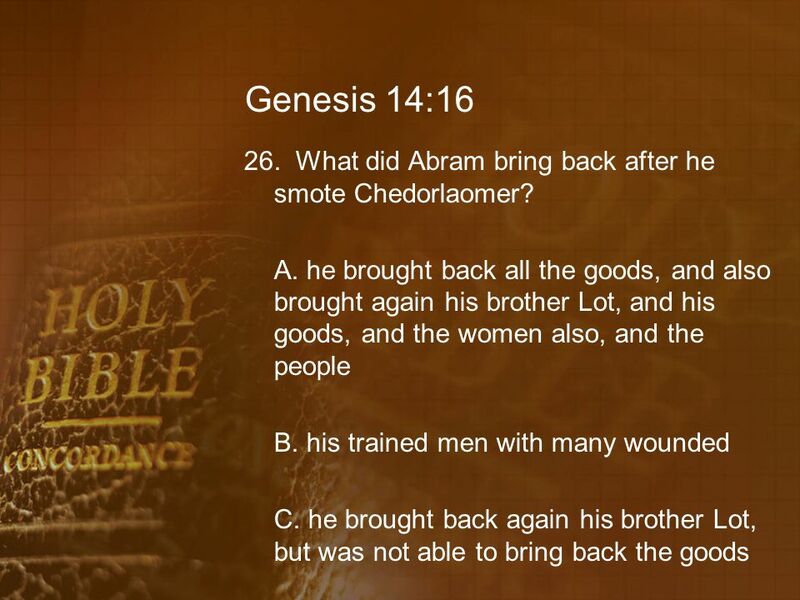 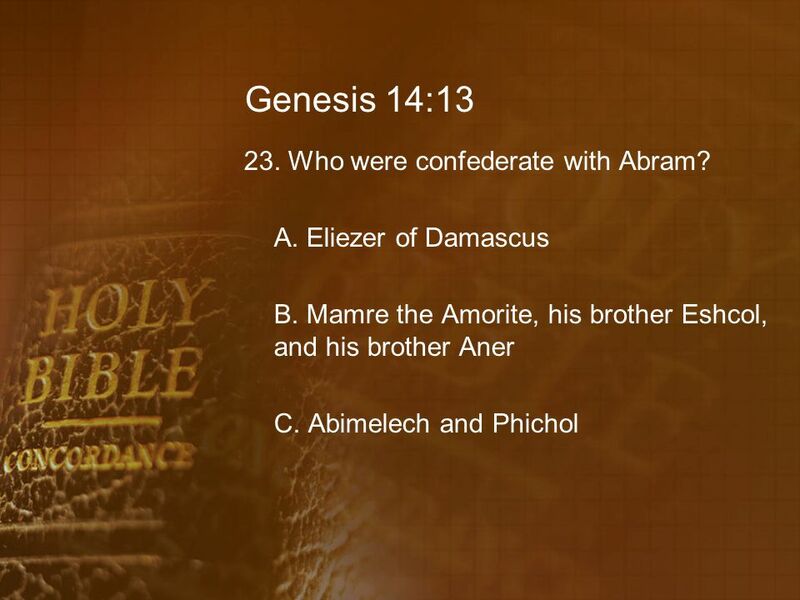 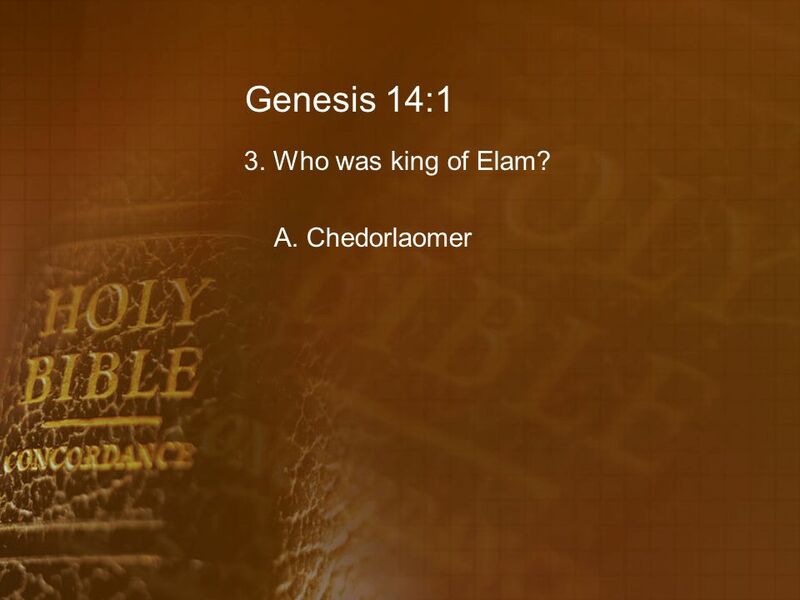 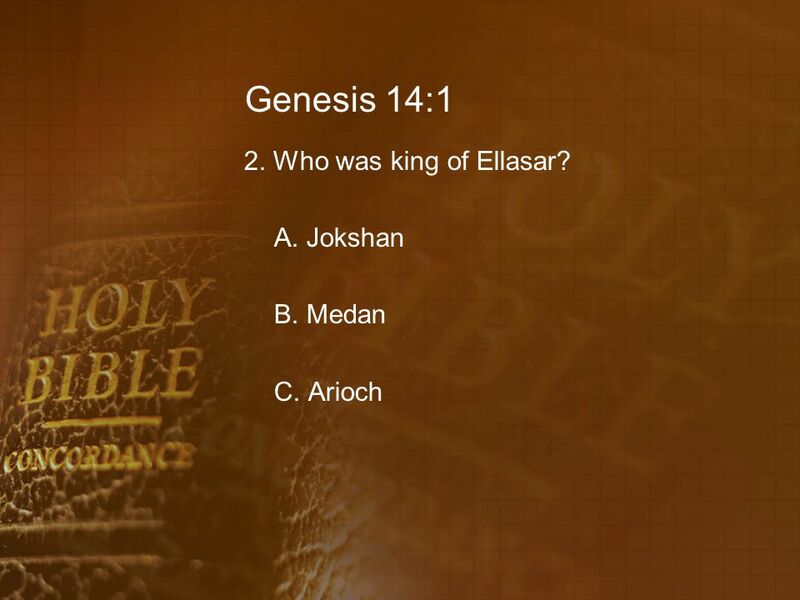 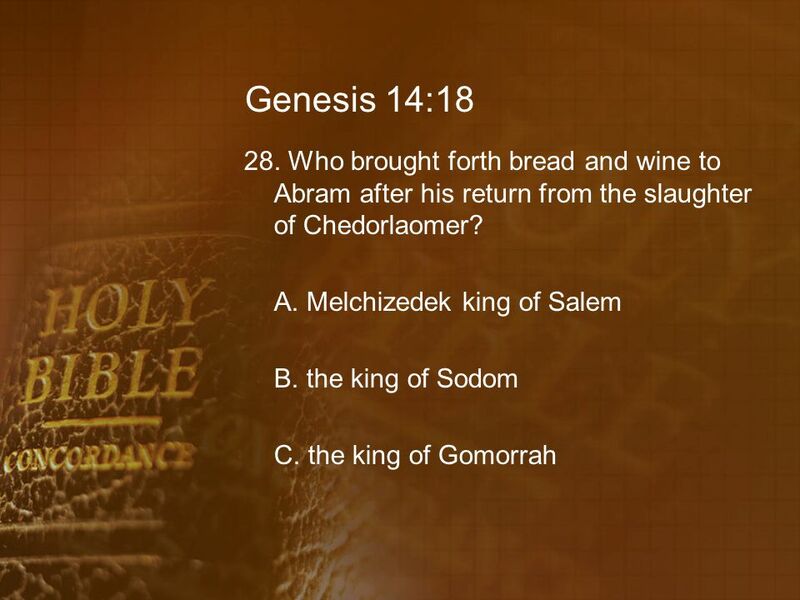 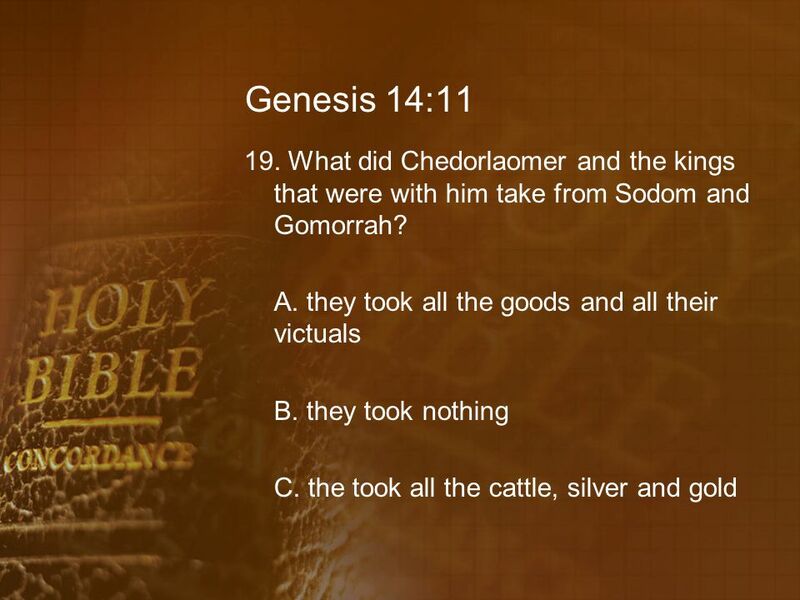 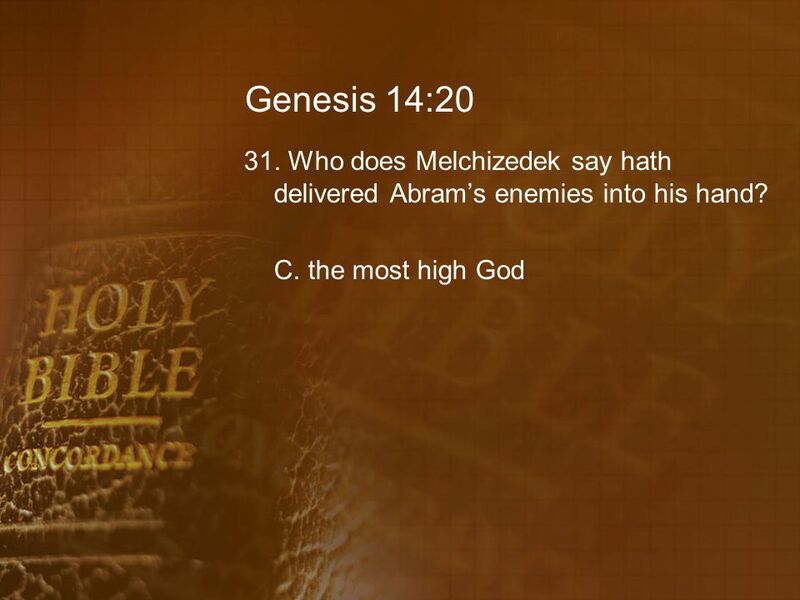 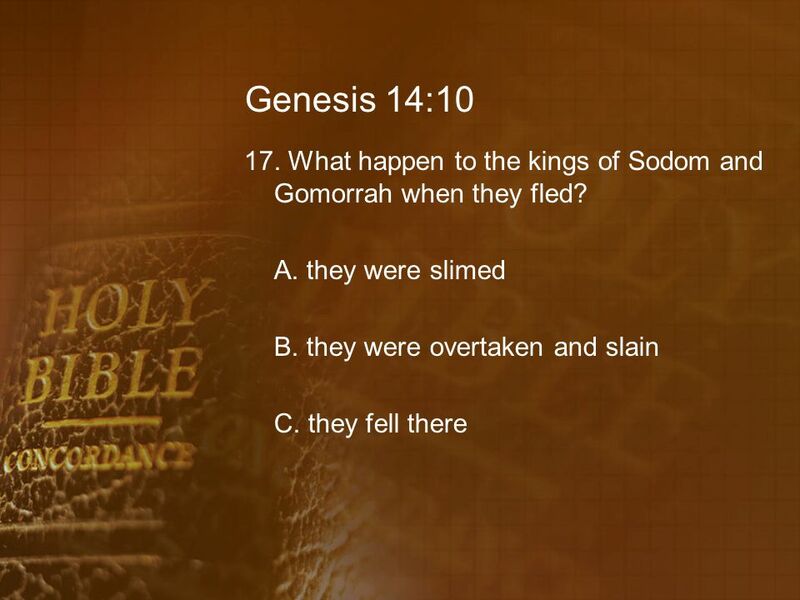 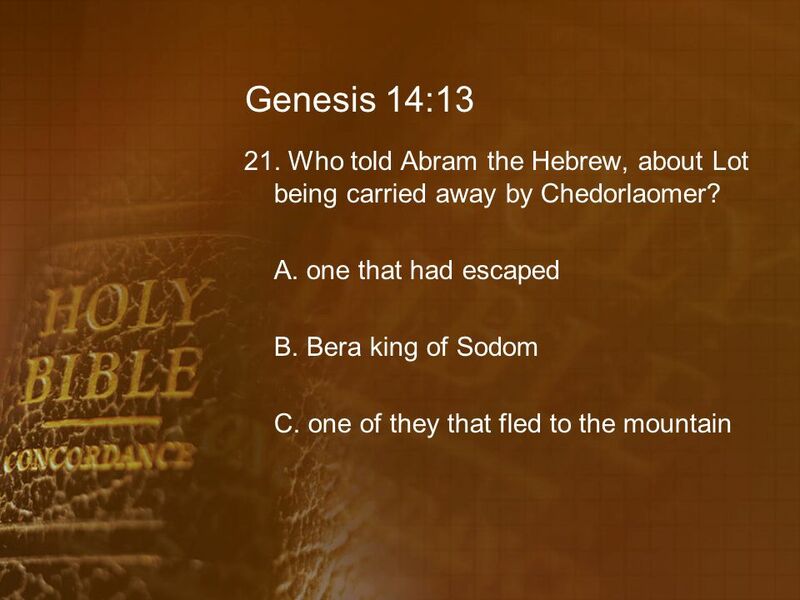 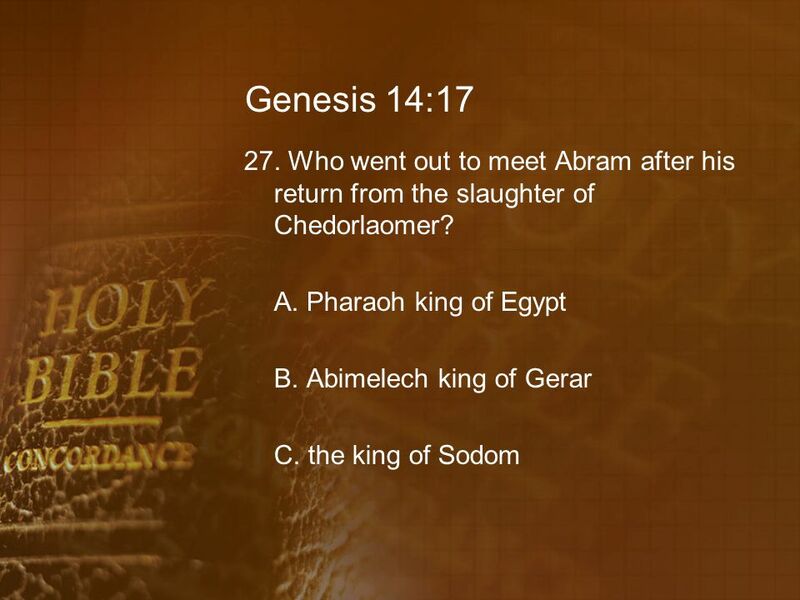 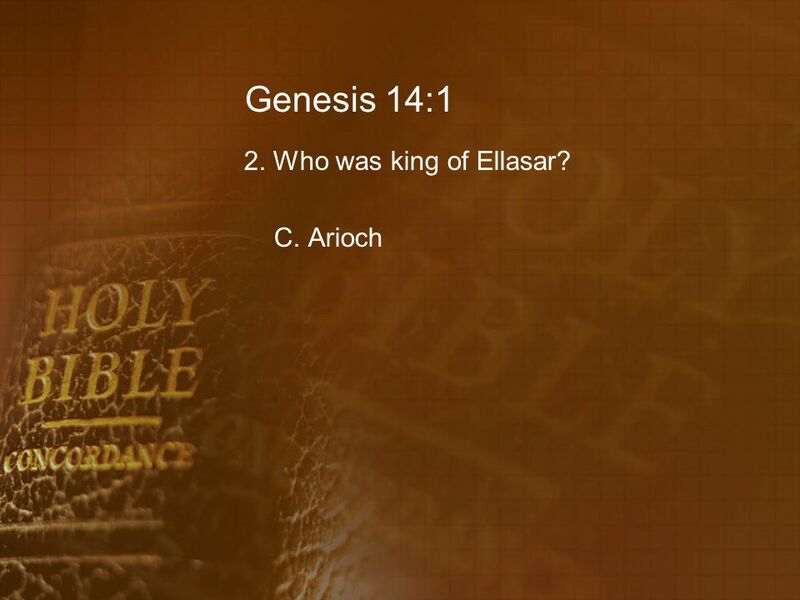 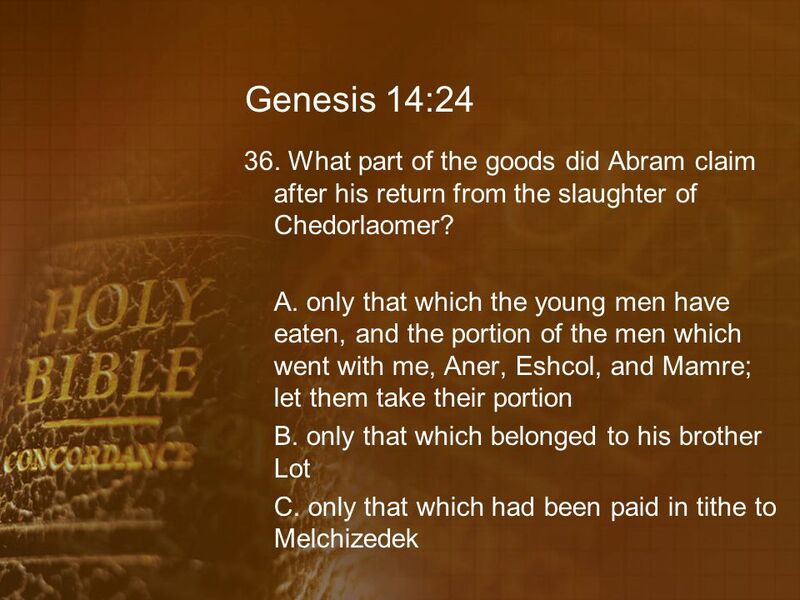 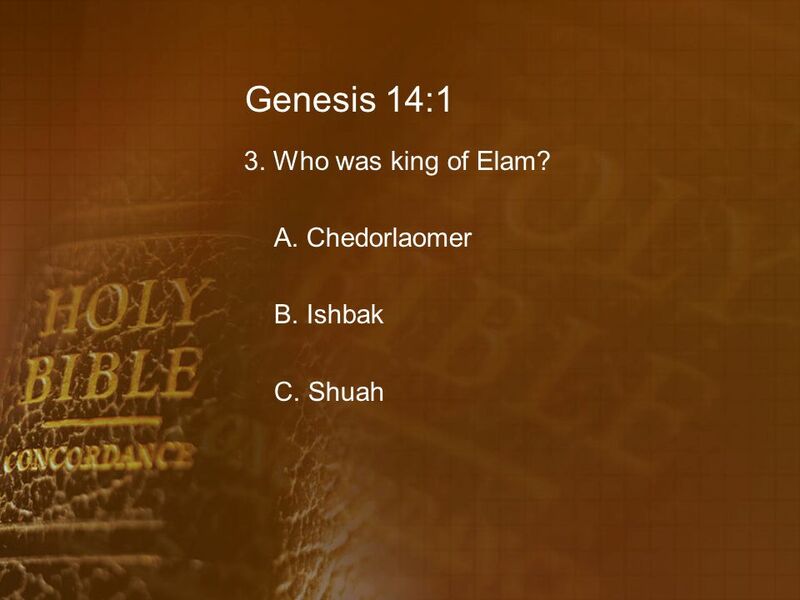 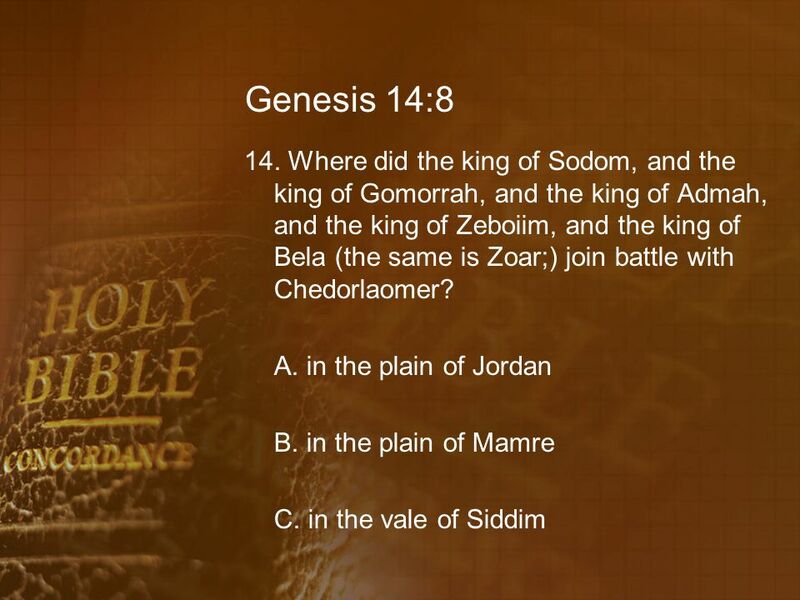 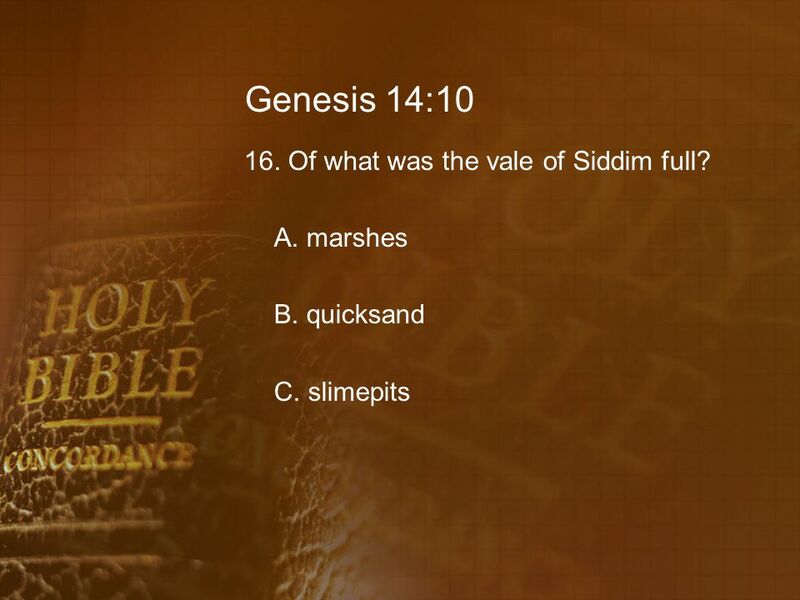 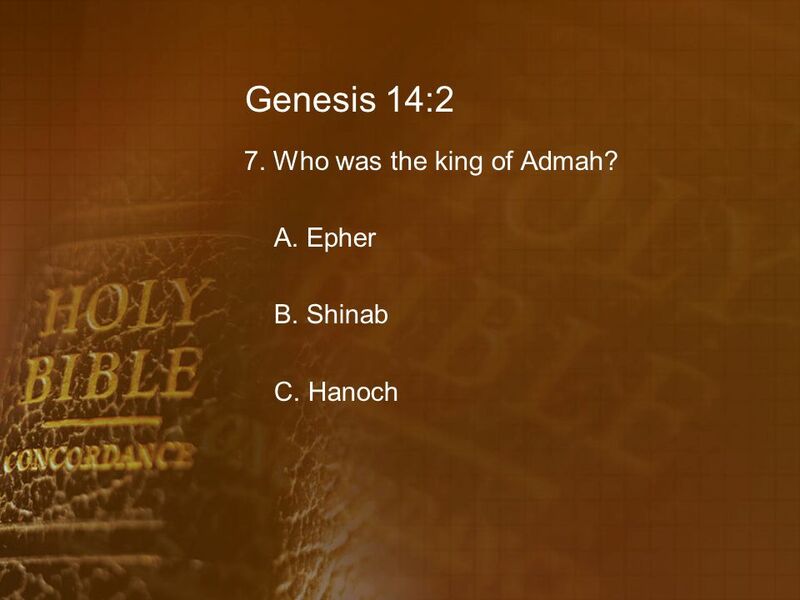 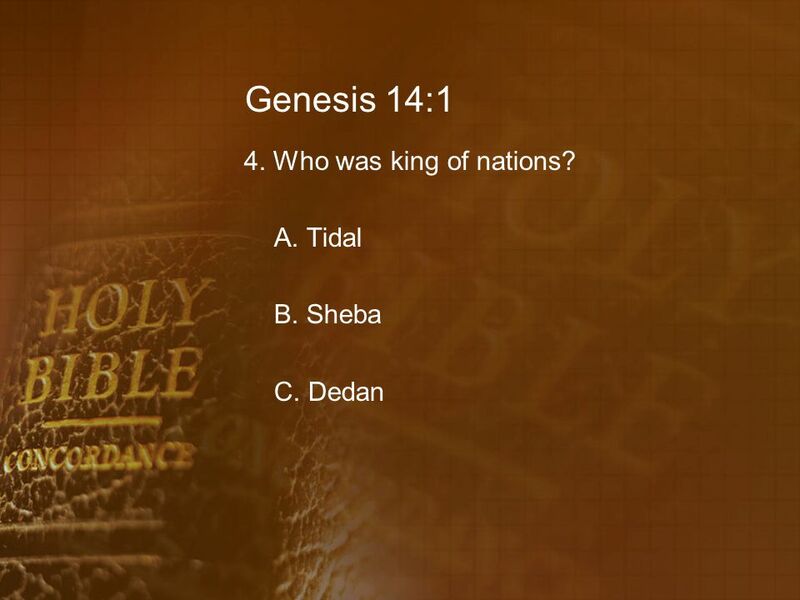 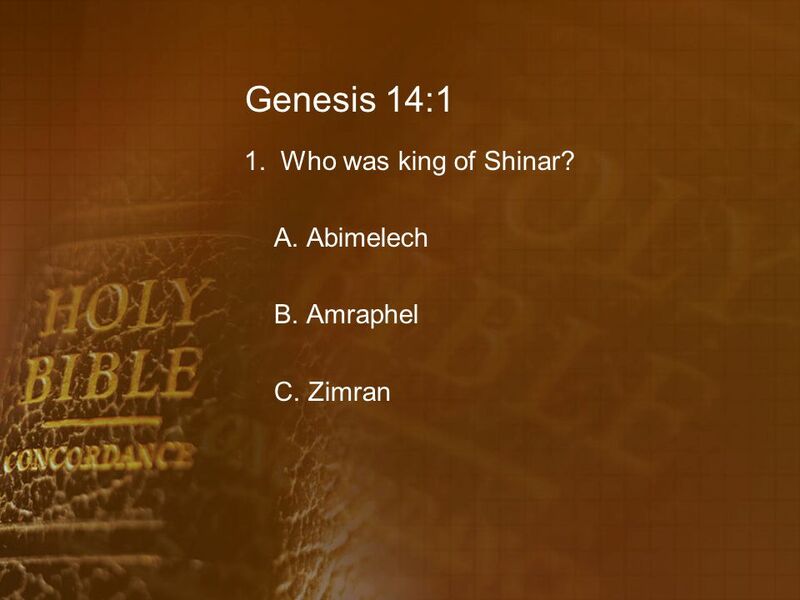 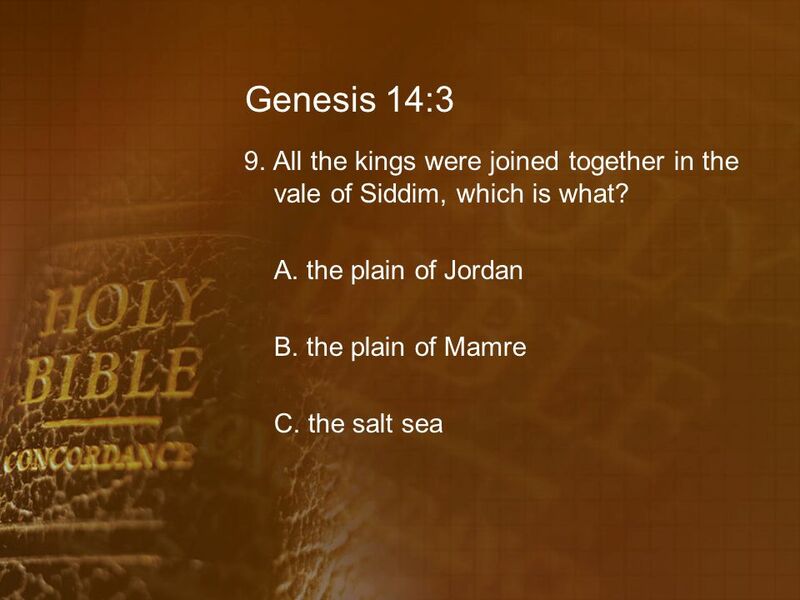 Genesis Chapter Fifteen Questions Bible Bowl 2013. 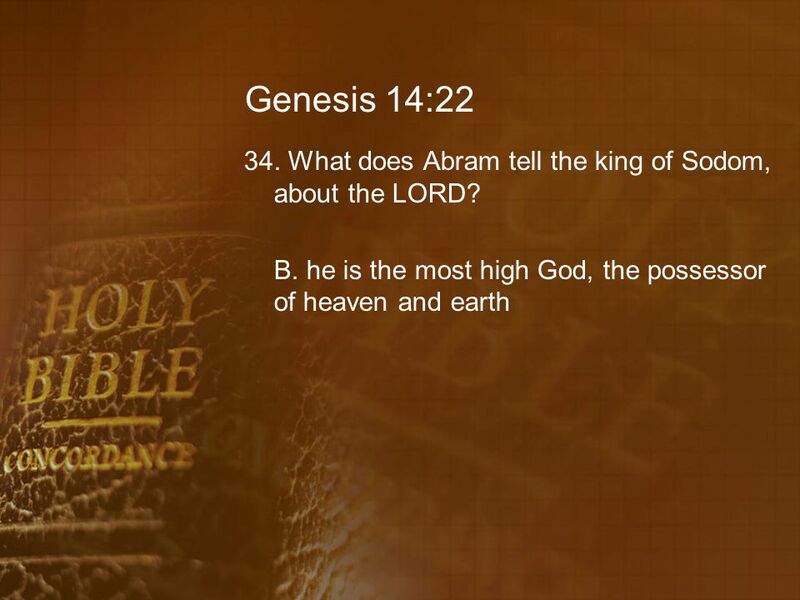 Heb 11:1 ¶ Now faith is the substance of things hoped for, the evidence of things not seen. 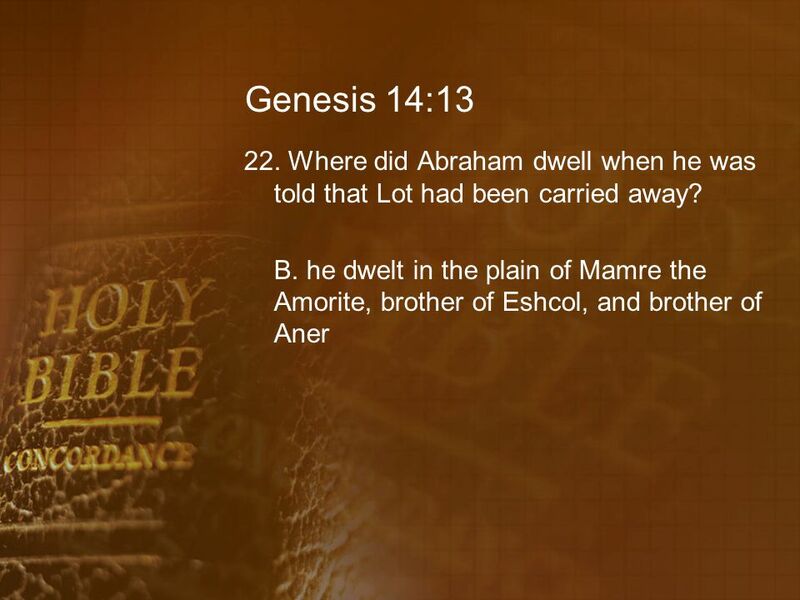 2 For by it the elders obtained a good testimony. 3 By faith. 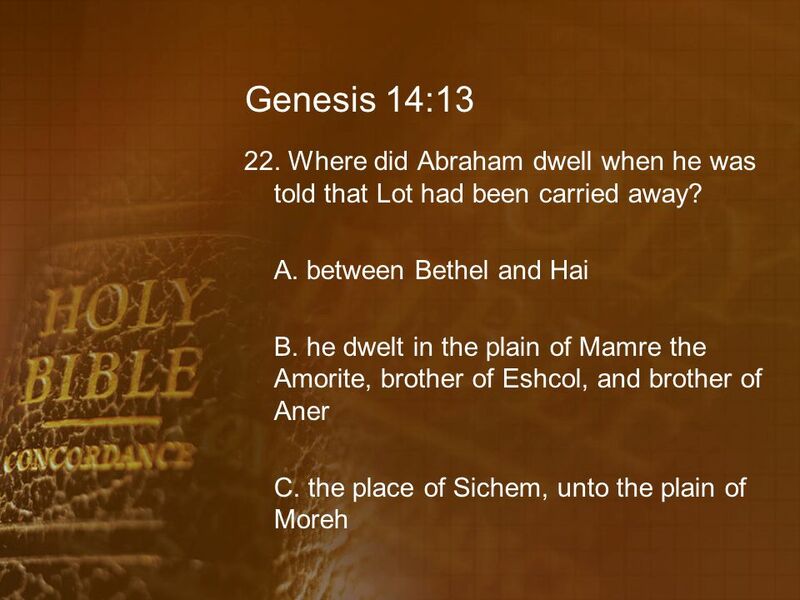 A New Journey Genesis 9-16 The world was created It was wiped clean A new start with Noah and his family Rules Promises Reality. Welcome to Shema Bless the Lord! 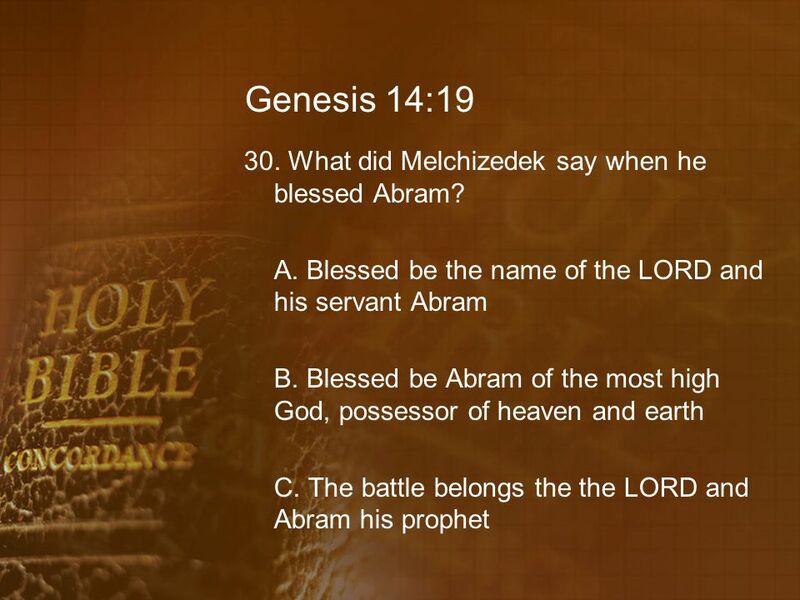 Bless the Lord who is worthy to be praised for all eternity ! 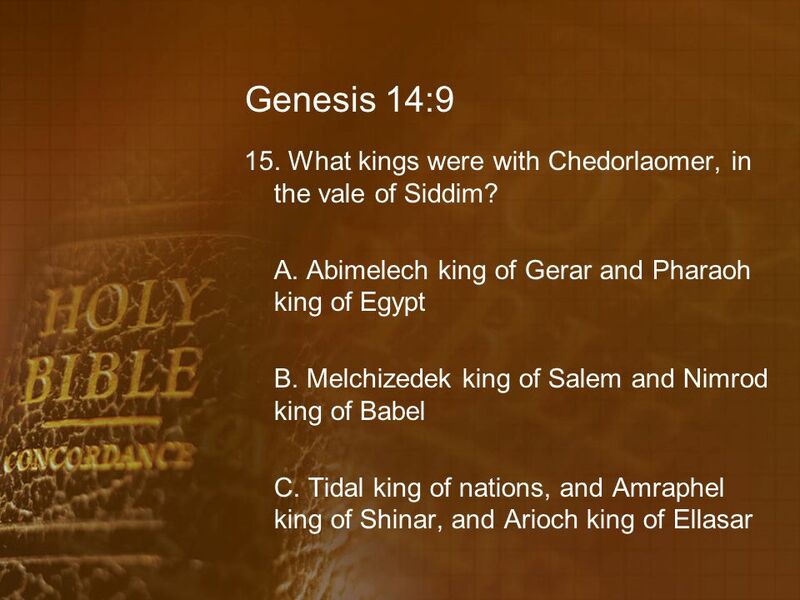 Genesis Chapter Thirteen Questions Bible Bowl 2013. 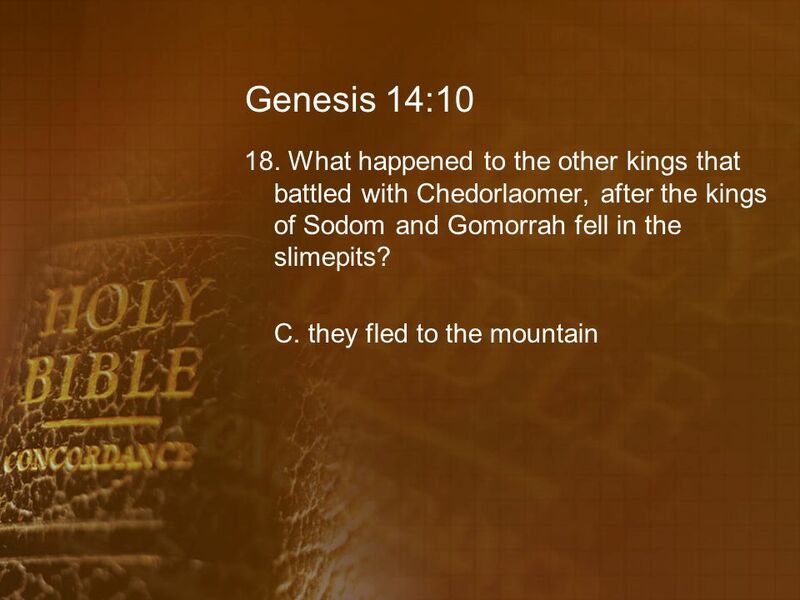 Genesis Chapter Twenty- three Bible Bowl Genesis 23:1 1. 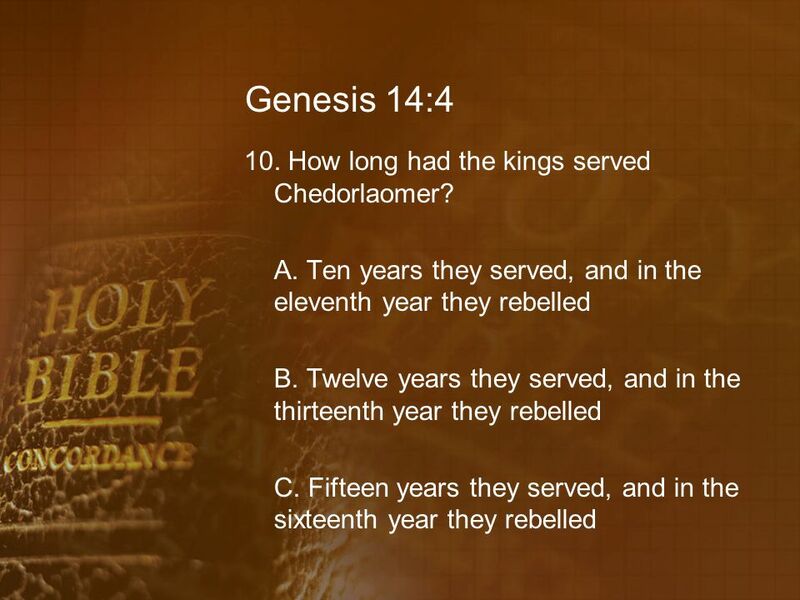 What were the years of the life of Sarah? 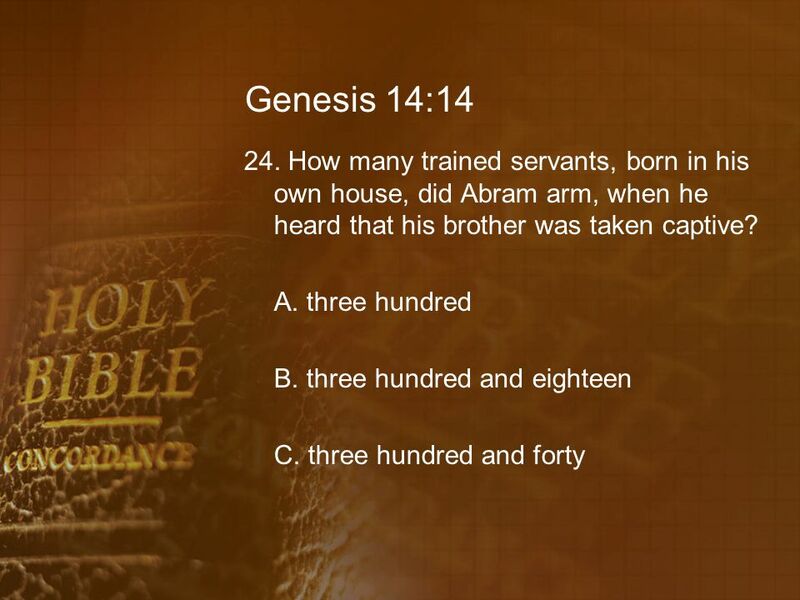 A. an hundred and seven and twenty years old. 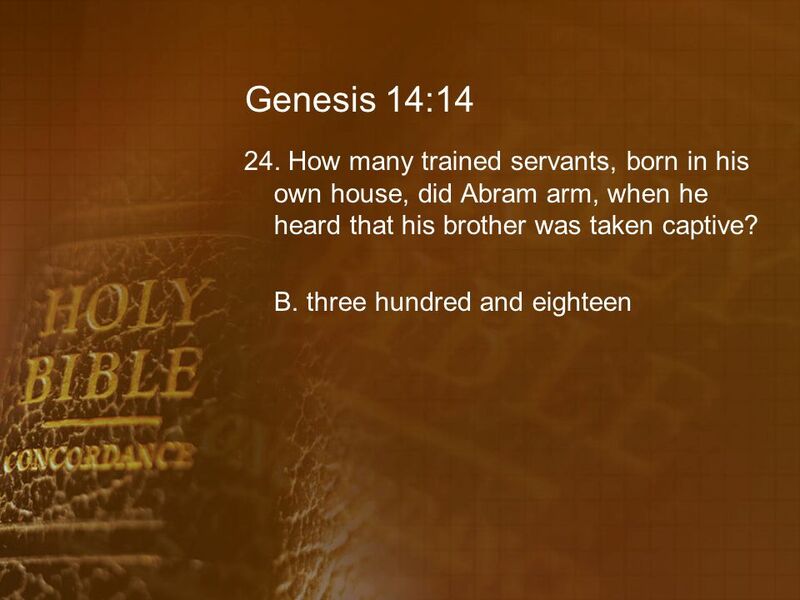 Biblical Stewardship: 1. 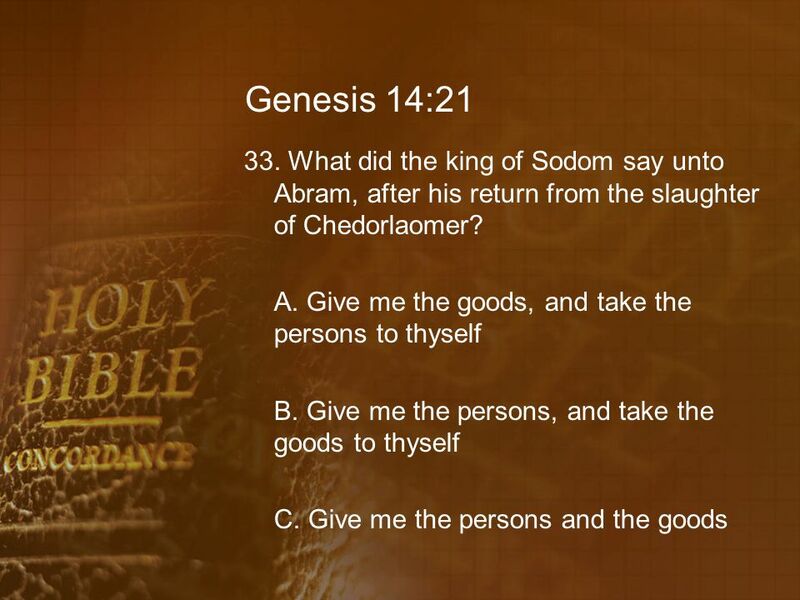 Who’s in Charge? What is the tithe? 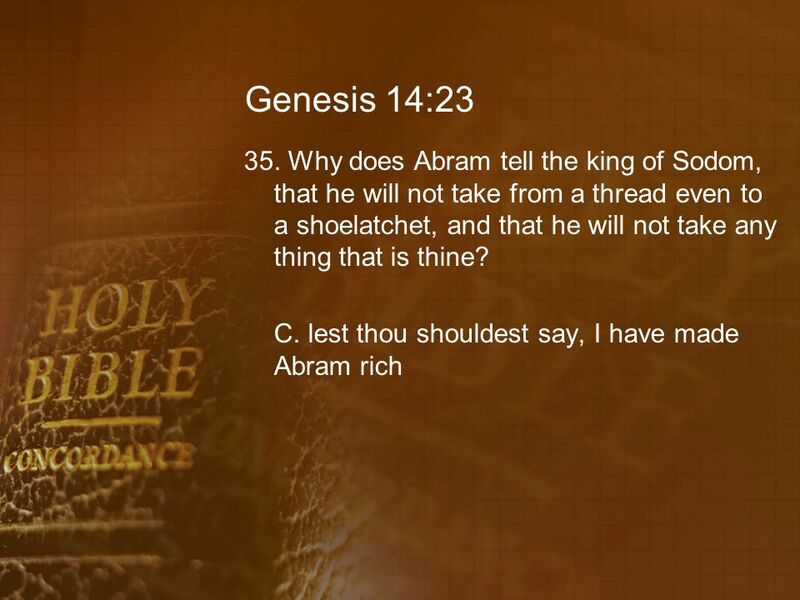 A definite proportion. 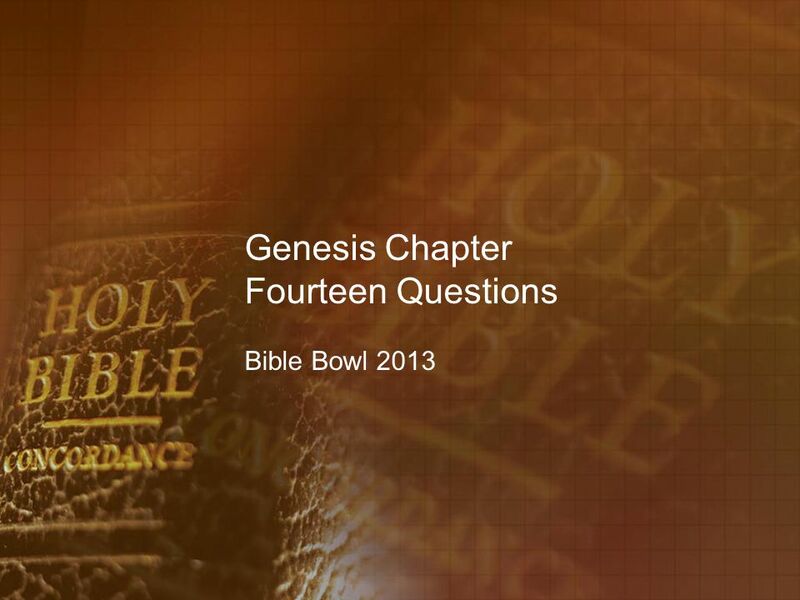 Review Genesis Chapters One - Fourteen Bible Bowl 2013. 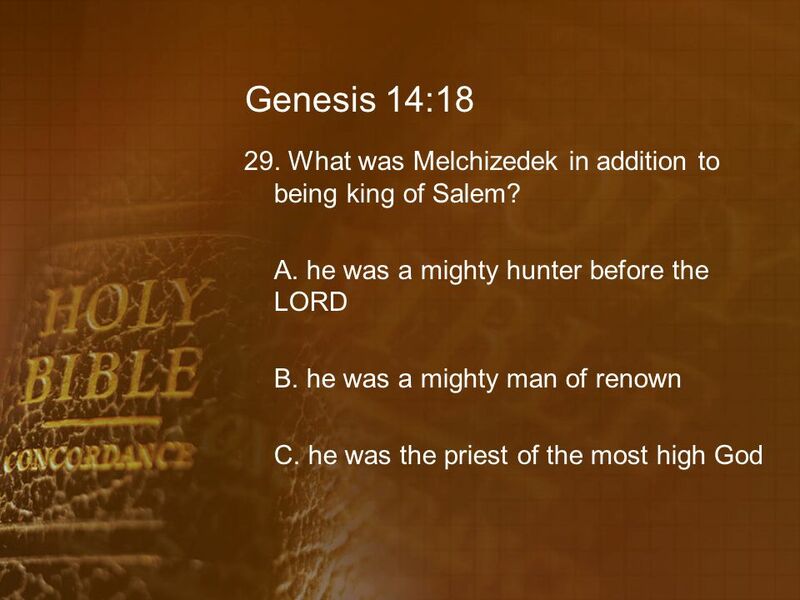 What is the Christ: A High Priest To Be The Christ The Christ is to be the Greatest King Foreshadowed by David The Christ is to be the Greatest High.